Our Sweet Tree Team building activity is full of fun and laughter that everyone will enjoy. Teams will be asked to create and present their work in a short space of time. They will have to work quickly, efficiently and work as a team. They will encounter unusual challenges that will require them to quickly problem solve and learn new skills. They will be working in a different environment and out of their usual workplace. Sweet Creations will bring out a whole host of skills for your staff to bring back into the work place. The team will get the chance to taste various retro sweets, chocolates and present day candy throughout the activity. This will benefit your staff by working as a team, understanding that various members of the team have different skills to themselves, help to work within a budget or limited material. Sweet Creations will start by introducing their team to you and making a sweet tree in front of everyone. Our staff will be on hand to help with each group of people. They will be able to help you get motivated and work as a team. The whole group will be split up into teams. This can be decided by us or by yourselves. Each team will be given a set of instructions and all the materials and candy that they will require. Each team can make either 1 large tree or individual trees to create their own team's collection. They are not as easy as it looks but you will have lots of fun making them. After the sweet trees are made, each team will need to design some promotional material, branding and a suggested pricing structure. 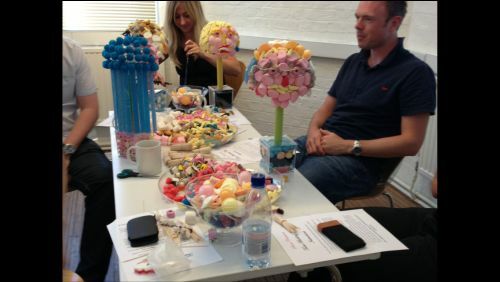 The team will need to create an advert to promote the sweet trees that they have created. Each team will do a short presentation to the Sweet Creations staff. All teams will be judged and given a score out of 20. The winning team will win a selection box of sweet sushi.